S C R A P M A S T E R: Catching up! No more apologizing for not posting as frequently as I should. This is my new normal and it is better to accept it instead of letting it make me guilty. ! I just hope my lovely followers don't mind hearing from me once in a while instead of all the time. So let's catch up. 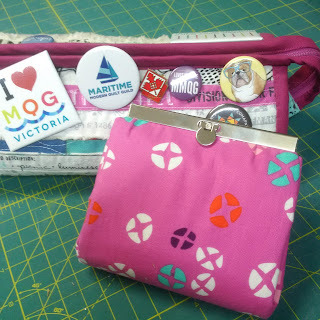 First up..."From Halifax to Edmonton" a small quilt I made from Kaffe Fassett scraps I received from my friend, Ioleen, in Edmonton. 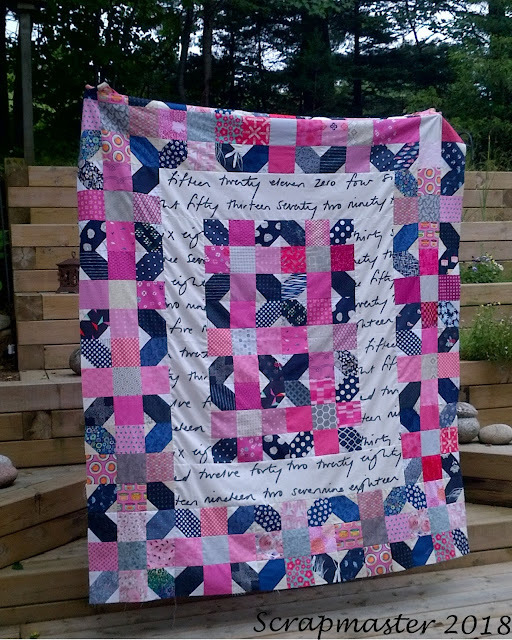 I gifted her this quilt when she visited our lovely little guild, MMQG recently, arriving with gifts from her as well. You just can't take the NS out of the girl! Plus I also tested my new block pattern to see if I liked it. Yes, I do! 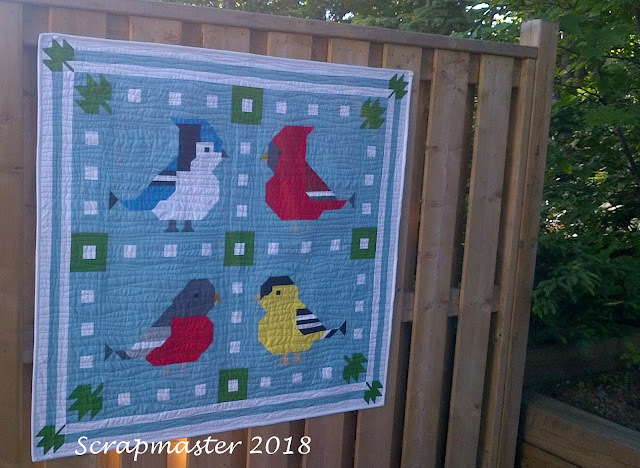 Secondly..."Quilting is for the Birds" I tested this pattern for sweet talented Nova Scotia designer John of Art East Quilting Co. A very easy pattern with great instruction. https://www.etsy.com/ca/shop/ArtEastQuiltingCo Check out John's puffin. His new nautical quilt is amazing and should be available soon. Thirdly...not quilted...just about to baste together for quilting. 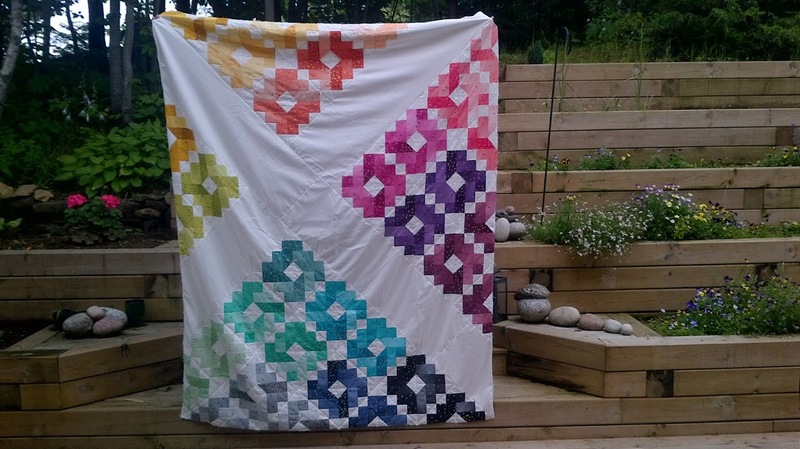 This quilt top is my rendition of Emily Dennis' Metallic Ombre quilt along http://www.quiltylove.com/category/quilt-alongs/ If you look at the original quilt you can see that I left out some of the blocks in order to have more negative space and also a way to keep out some of the colours that I did not prefer to be in my quilt. No. Four...."Icy Waters" by Amy Garro Paperpieced and fun to make. 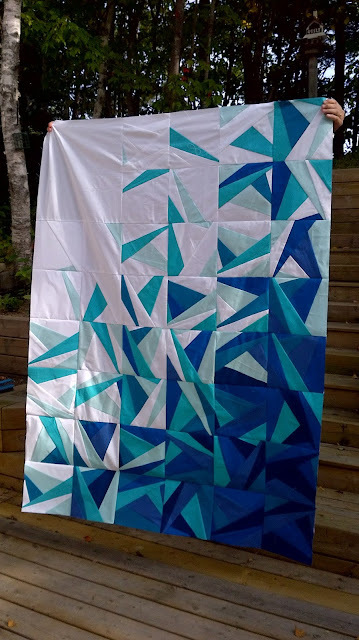 The colours I used are those of the Maritime Modern Quilt Guild...All Kona...White, Aqua, Breakers, Oasis, Regatta, Pacific, Prussian. This top is destined to become a gift for a special someone and it is a reminder of the beautiful day we had at Niagra Falls this past summer. These colours matched the water colours that day. Number 5 - Still a flimsy. 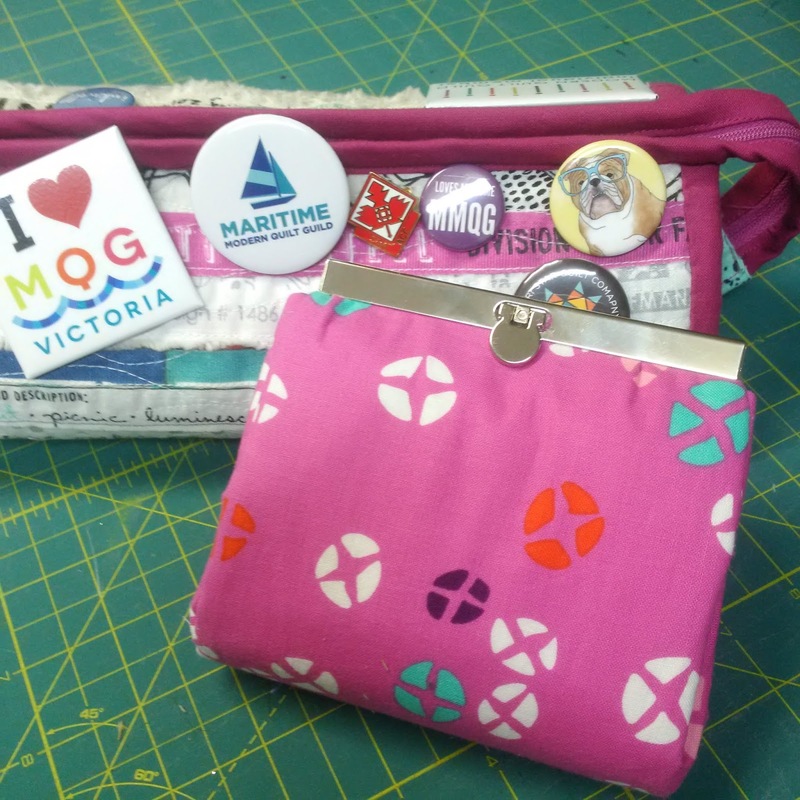 I was lucky to win the pink and navy blocks at my guild's Block Lotto and so of course I had to sew them up into something special. I love how the Nummers fabric takes it to a new level. At least for me it does. #6 - Not a quilt. I like to make small projects in between the larger ones. 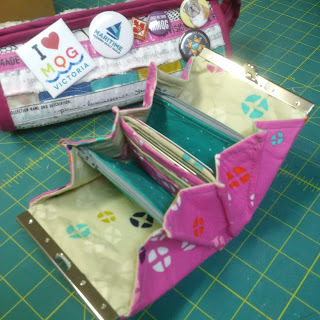 Made this Mini Prima Diva Wallet for my daughter. It fits perfectly in the apron she has to wear at work and then she has no need to drag a purse to work and then find a safe place to store it while she works. She is a Cotton and Steel nut so next up for her is a wallhanging for her bedroom from C+S prints. You are a busy bee, Linda! All very lovely! You can accomplish so much without a computer!! Beautiful work. Beautiful Quilts and purse! Busy gal. Beautiful finished and near finishes. 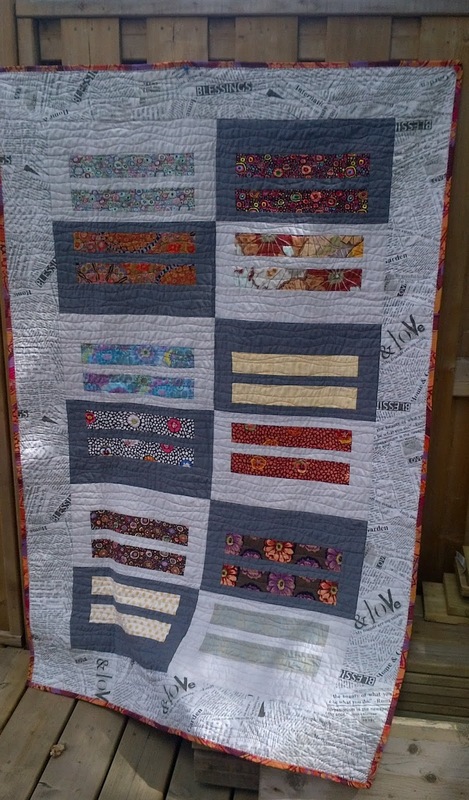 I will be showing my quilt at coffee with the neighbours and at sew day. I am so thankful that you made me a beautiful quilt. Linda you are amazing. 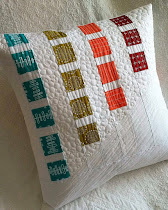 Love your choice of colours for each quilt. Busy gal. Nice to see you last week. So much eye candy here, I don't think there is anything I don't like. You reminded me I have the pattern for Icy Waters, another on the ever expanding to do list. Please don't tempt me any more. Hi Linda! Welcome back. Less frequent is better than not at all in my books! 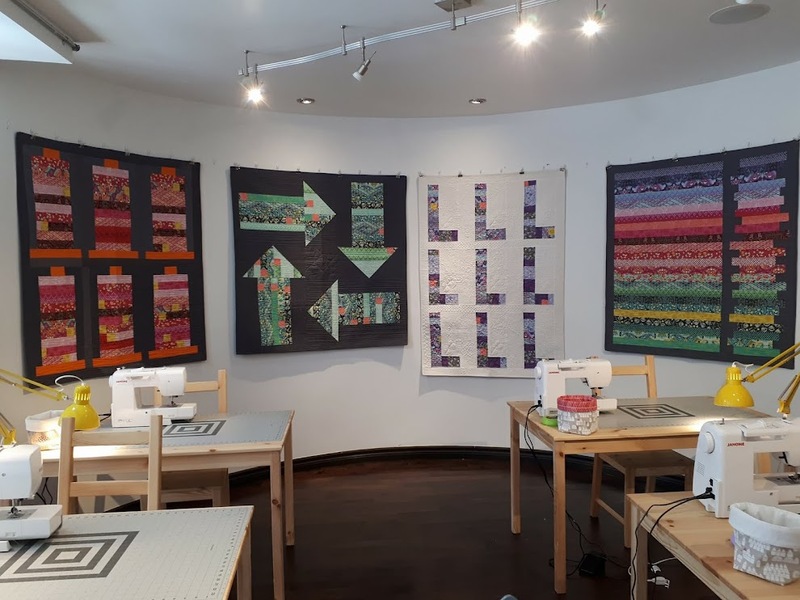 Some wonderful quilts here! My fav is the Metallic Ombre - LOVE it!! Will I see you at NSFAF this week? I know how you feel. I just can't find the time to post as much as I'd like either. All of your quilts are great. Just stitching.